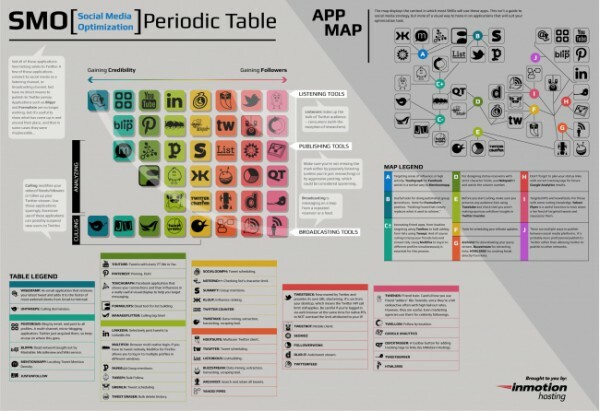 The SMO Periodic Table and App Map infographic provides a visual layout for exploring the world of social media optimization tools. 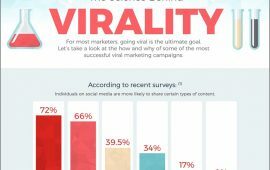 This infographic can help web business owners identify the different Twitter-related applications that are useful for building traffic and bringing users to ultimately their web hosted sites. The Social Media Optimization (SMO) Periodic Table uses the periodic table of elements layout to group together similar applications that provide increased functionality and capabilities that support the use of Twitter and other Channels. The table groups together on the horizontal level the apps that are Listening Tools, Publishing Tools and Broadcasting Tools. Going across the vertical, the apps range from those useful for increasing credibility to those that are more focused on gaining followers. 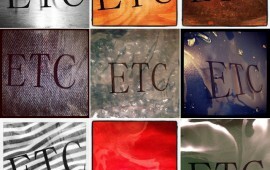 Some of the tools are also categorized as Analyzing Tools and Culling Tools. By using the SMO Periodic Table to find an app, the user can determine which Twitter-related tool may benefit their particular need. At a glance, the table makes it much easier to determine the starting point for selecting an app without having to cull through a list of apps in a hit-or-miss fashion. Once the user hones in on the particular area of interest, they can then delve into the specific features of the app in that category. The App Map works in a different manner to the SMO Periodic Table but showing the direct connections and contextual relationships between the tools. The App Map provides a visual road map with lines that connect workflow between different apps and even some tools to make their use more efficient. A map legend breaks the apps down into ten groups and identifies that group’s features and usage. The groups cover areas such as scheduling, building lists, publishing, location targeting, creating feeds and culling. Lines connect the apps with similar functionality and also show that several apps may bridge two or three different contextual groups. The SMO Periodic Table and App Map are great visual tools for helping Twitter users and business owners to select the appropriate social media optimization apps in an elegant and straightforward manner. Brought to you by Juliana from InMotion Hosting, a VPS Hosting provider based in Los Angeles. Check out all her tech Twitter tactics on @JulianaPayson.